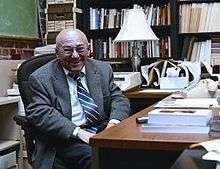 John Lachs is the Centennial Professor of Philosophy at Vanderbilt University, where he has taught since 1967. Lachs received his Ph.D. from Yale University in 1961. His primary focus is on American philosophy (he has written a book and several articles on George Santayana) and German Idealism. Lachs was born in Hungary and emigrated to Canada as a child. He has been a member of the Vanderbilt faculty since 1967 and has written a number of books and many articles over this period and before. He served as President of the Metaphysical Society of America in 1997. He is recognized as an outstanding teacher at Vanderbilt faculty, receiving the Graduate Teaching Award in 2000, the Outstanding Commitment to Teaching Freshmen Award in 1999 and the Madison Sarratt Prize for Excellence in Undergraduate Teaching in 1972. His style is highly accessible as Lachs is committed to making philosophical questions and their discussion come within the grasp of all his audiences. Lachs is a pragmatist in the tradition of William James and Josiah Royce. He was President of the William James Society in 2007. Lachs is the faculty adviser of Young Americans for Liberty at Vanderbilt University and is a libertarian. Among the prominent alumni whose Ph.D. dissertations he has advised are many of the leading figures in bioethics, pragmatism, and a number of public intellectuals, including Glenn McGee, Ph.D., Paul Menzel, Ph.D., Herman Saatkamp, Ph.D., On April 3, 2013, he became one of three professors in Vanderbilt's history to receive the prestigious Alumni Education Award twice. His philosophical interests center on human nature. This takes him into metaphysics, philosophy of mind, political philosophy, and ethics. He has continuing research interests in American philosophy and in German Idealism, along with research and teaching interests in medical and business ethics. Lachs is general editor of the Encyclopedia of American Philosophy. An issue of The Journal of Speculative Philosophy will be devoted to his essay "Both Better Off and Better: Moral Progress Amid Continuing Carnage," with responses from a half dozen philosophers. He is also chair of the American Philosophical Association's Centennial Committee, charged with celebrating the private value and social usefulness of philosophy. Plans are being made for activities throughout the country, ranging from radio programs to book signings and coffee house conversations, designed to show the relevance of philosophy to life. Intermediate Man. Hackett Publishers, Indianapolis, 1981, paperback 1983. Mind and Philosophers. Vanderbilt University Press, 1987. The Relevance of Philosophy to Life, Vanderbilt University Press, 1995. In Love with Life, Vanderbilt University Press, 1998. Thinking in the Ruins: Wittgenstein and Santayana. Vanderbilt University Press, 2000. A Community of Individuals. Routledge, 2003. The Philosophy of William Ernest Hocking (ed. with Micah Hester), Vanderbilt University Press 2001. "Human Natures," Proceedings of the American Philosophical Association, 1990. "Stoic Pragmatism", Indiana University Press, 2012. Meddling: On the Virtue of Leaving Others Alone, Indiana University Press, 2014. ↑ "Glenn McGee". Retrieved 2012-12-06. ↑ "Paul T. Menzel". Retrieved 2012-12-06.